Celebrating the life of Fred Charles Laub, Jr.
Obituary for Fred Charles Laub, Jr.
Fred Charles Laub, Jr. was born January 4, 1924, the first of seven sons born to Fred and Elgie (Hogue) Laub in Norwood, Missouri. 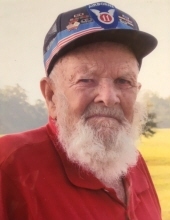 He passed away February 2, 2019, at his daughter’s home in Denham Springs, Louisiana. Fred enlisted in the U.S. Army January 7, 1941. He always said it was because he, “didn’t want to miss anything”, and then he would say, “and I didn’t!” He served in the 11th Airborne Division as a medic. He was in the Pacific Theater, survived four invasions in the Philippines, New Guinea, Guam, New Zealand and Australia. He came home September 1945 with the Purple Heart, Bronze Star and other medals. November 29, 1945, Fred married Ferne Wymer. To this union was born a daughter, Freda Elaine, and a son, Micheal Joseph. In the first years of their marriage and end of World War II, Fred worked various jobs and lived in several places. He did roofing, construction work, tried farming in Missouri, and then worked for John Deere Tractors assembling tractors in Waterloo, Iowa. He then moved his family to Kansas City, Kansas, and worked at General Motors assembling cars. He built a home in Kansas City. He then took the civil service test and began working with the Federal Bureau of Prisons in Fort Leavenworth, Kansas. The family moved to Lansing, Kansas. Fred built another home in Bonner Springs, Kansas, where the family lived until he was transferred to Lompoc, California, to work in the federal prison. After a few years there, he was transferred to Florence, Arizona. After several years there, he was sent to Pleasanton, California, until he retired. (Fred liked to travel and visited all fifty states, four provinces in Canada and Mexico). After retiring they moved to Neosho, Missouri, then to Republic, Missouri, then to Hammond, Louisiana, and finally Denham Springs, Louisiana. Fred was preceded in death by his wife, Ferne (Wymer) Laub, his parents, Fred and Elgie (Hogue)Laub, brothers, Herbert Laub, Johnny Laub, Allen Laub and Toby Laub. He leaves his daughter, Elaine Doolittle, and husband, Melvin, of Denham Springs, Louisiana, his son, Micheal Laub, and his wife, Bonnie, of Coolidge, Arizona, eight grandchildren, sixteen great-grandchildren and one great-great-granddaughter, two brothers, Price Laub and wife, Lorene, of Marshfield, Tony Laub and wife, Neva, of Flippin, Arkansas, and several nieces and nephews. To send flowers or a remembrance gift to the family of Fred Charles Laub, Jr., please visit our Tribute Store. "Email Address" would like to share the life celebration of Fred Charles Laub, Jr.. Click on the "link" to go to share a favorite memory or leave a condolence message for the family.